When I was out undertaking an Urban Geography field observation exercise (see: Gentrification: What Has Geographers Banging Their Heads Against the Walls and Has Planners in Knots While Auckland is Not Immune!) one of the first places observed with the large Onehunga Mall/Neilson Street intersection. The intersection is very wide with motorway traffic coming from the bottom and the left, Onehunga Town Centre to the top, Onehunga Station to the top right and Neilson Street to the right feeding into the main Onehunga-Southdown heavy industrial complex. To make it more fun the City Centre to Mangere/Airport Light Rail line is to come up through Onehunga Mall as it makes its way to the City Centre and Airport. This single large intersection has three competing uses that all have high impact on one another including the wider health of Onehunga. So what do we do? First some context. The question is though what are you building East West Link Option B for? Is it to move freight in a diminishing industrial complex or is it to be a boulevard connecting various residential and employment areas between State Highways 1 and 20 in thirty years time? If you said the former then I would recommend looking at the Urban Geographic trends as I outlined in my previous post linked above. The complex will not exist in 30 years time as competing land use pressures (triggered ironically by East West Link itself as well as the light rail, and Transform Onehunga) will have industry decamp Onehunga and seek less pressured areas like Wiri and Drury South. If you said the latter (the boulevard) then that would be about right – given industry will decamp and give way to residential and employment through the 30 year period. 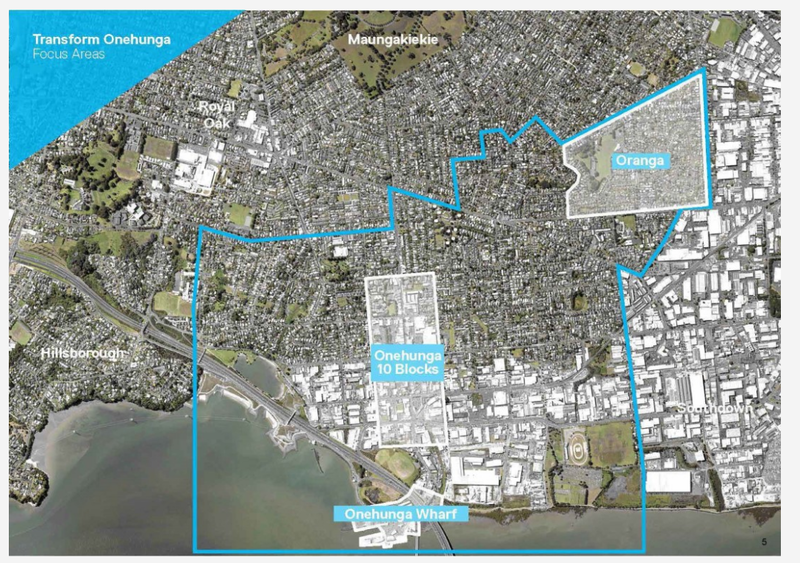 However, given East West Link – Option B runs the entire length of Neilson Street and crosses Onehunga Mall where Light Rail and a new Transit Mall would connect Port of Onehunga and Onehunga Town Centre and we have a thirty year transition period from industry to residential and commercial things get messy. 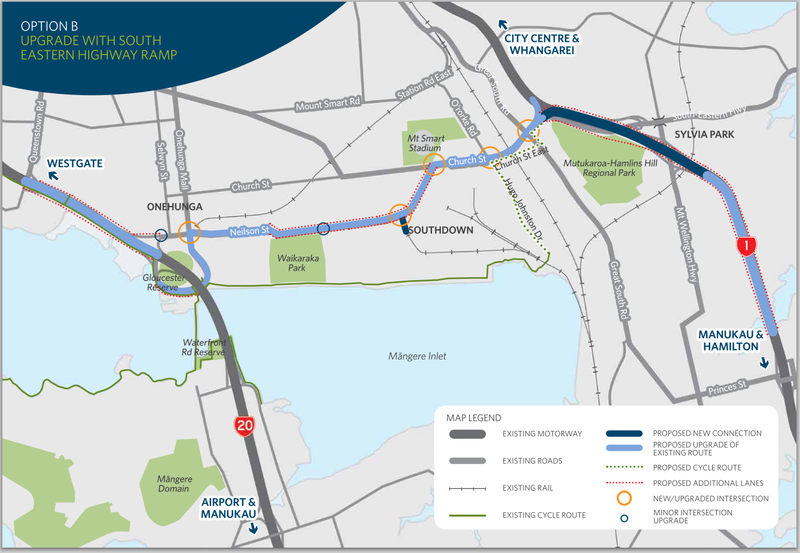 No doubt the CC2M (City Centre to Mangere Light Rail or Northern Airport Line) will come up from Mangere through Onehunga Mall and Onehunga and on its way to the City Centre via Dominion Road. This Rapid Transit line is designed to improve accessibility between residents and employment centres (Airport to Botany is the express link to the Airport from the City Centre) and consequently will place pressure on the decamping industry nearby. The Line will also connect Port of Onehunga to Onehunga Town Centre forming a transit mall up Onehunga Mall. However, as mentioned earlier the Line/Transit Mall still needs to cross over Neilson Street which serves as the East West Link thoroughfare linking State Highways 1 and 20. Even with the transition over thirty years from industry to mixed use residential and commercial the Neilson Street/Onehunga Mall intersection is going to be extremely busy and a severance for both Onehunga and the Light Rail Line. How do we fix this? I will come to that in the moment. Transform Onehunga is the third big urban renewal project after Wynyard Quarter and Transform Manukau (also interchanged with Our Manukau). Like Transform Manukau it covers 600 hectares, is a long term project over 30 years, has multiple land uses inside the area and has competing land use pressures. Onehunga Wharf will become the Manukau Harbour’s mini version of the Waitemata’s Wynyard Quarter – premium urban space. Onehunga Town Centre will like Manukau revitalise itself. Both have light rail connecting them and both face the severance issue of that large intersection. What to do about Neilson Street/Onehunga Mall? In short we trench Neilson Street so that it goes underneath Onehunga Mall and all motorway traffic from the Waterview bound side of the motorway is diverted up a new express link to Victoria Street that links back into Neilson Street where traffic can then disperse to where it needs to go. The Manukau bound side of State Highway 20 will continue to use the existing Neilson Street entrance and exit ramps. If you stand at the intersection you will notice Neilson Street elevates itself either side to meet Onehunga Mall, this makes sinking and trenching Neilson Street under Onehunga Mall a straight forward exercise that say sinking Cavendish Drive under the rail line in Wiri/Manukau/Puhinui which created a massive dip that floods. At the same time the 110 KV transmission line can also be boxed trenched as well. Given Neilson Street will be trenched and there will be no 4-way intersection with Onehunga Mall (this is intentional to remove severance and car rat running), to handle this a new link (the black line) would move the traffic to and from State Highway 20 to a new intersection this time with Victoria Street and Neilson Street (Victoria Street is a big 4 lane wide road with a large grass median). That way East West Link traffic can still move to and from Neilson Street and the motorway but without cutting off Onehunga Mall which becomes the new transit mall. As for East West Link running in between the Wharf and the set of motels across the road, that link would also be trenched and covered with a green way to remove that severance and allow better people linkages especially with the new transit mall. With Onehunga Mall now a transit mall (housing the light rail line) and free of motorway traffic (thanks to the new trenched and extended link to Neilson Street via Galway Street) it is time to begin some proper urban regeneration along the new transit mall. This urban regeneration would be the first example of industry decamping and mixed use residential/commercial taking its place to make use of better accessibility and amenity. This new area and transit mall stitches up Onehunga Wharf with Onehunga Town Centre (both inside the Transform Onehunga area) removing the traffic severance long plaguing the area. Of course Neilson Street as part of East West Link is still available as it transitions from a freight mover to a boulevard and people mover over the next thirty years. By trenching Neilson Street under Onehunga Mall and building a new connection with Victoria Street we get the best of both worlds for a transitioning area. Freight and later people movements are able to continue to move between State Highways 1 and 20 as East West Link was designed to do. Nothing grand like East West Link Option F was, just some good solid wins both Urban Geography and transport wise by going back to basics and looking ahead – not backwards! Isn’t your black line on Victoria St not Galway Street?